IRAS 04368+2557 is a protostar about 450 light years from us. It is a particularly young protostar, at about 300,000 years. Because of its age and proximity, it provides an excellent opportunity to study the early stages of stellar and planetary formation. Structure of a protoplanetary disk. Credit Sakai et al. 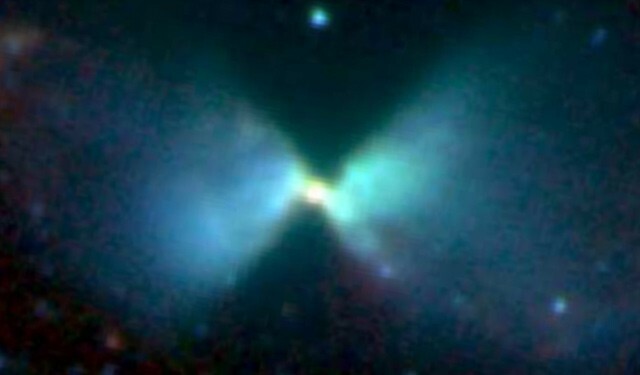 Like most protostars, this one has a protoplanetary disk out of which planets are expected to form. Surrounding that is a larger protostellar envelope. Between the two is a transition zone. 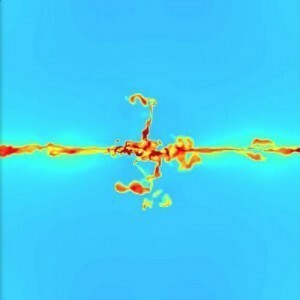 Because of interactions within the surrounding envelope, material can be slowed so that it gradually falls inward toward the protoplanetary disk. This can enrich the chemical composition of the disk. 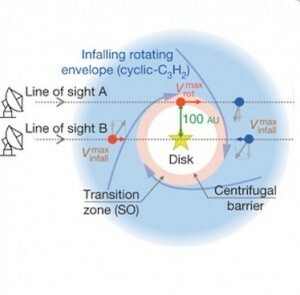 Now a new paper in Nature has found that the transition zone can have a centrifuge effect that chemically filters material entering the protoplanetary disk. The team looked at line spectra of both the disk and the surrounding envelope. The found that while the surrounding envelope was dominated by hydrocarbons, the region of the transition zone had high concentrations of sulphur monoxide. In other words the chemical composition of the two regions are dramatically different. This is likely due to a centrifugal effect where some molecules can more easily penetrate the transition zone, while others have a more difficult time. So it seems that early solar systems are not simply the product of the material surrounding a young star, but that they are more dominated by materials that can penetrate the transition zone.